Feeling sluggish from all the stress around you and somehow you anticipate a sickness coming? More than ‘a work of the mind’ to deter weakness, have something for your mind, body and spirit that invigorates, boosts your immune system and instantly pick you back up. Elite Nails spa brings an ancient healing treatment that will neutralize negative energies from your body which causes you stress and feeling down. This new treatment is called the Volcanic Stone Massage. The Volcanic Stone Massage uses hot volcanic rocks, usually basalts, to massage the body and has a lot of beneficial effects like easing muscular and rheumatic pain and helping curing backache, insomnia and depression. It gives you a general sensation of wellbeing that reflects also on your spirit. Using stones transmits energy, and when placed on the body will remove blockages, dissolve stress and bring about harmony, neutralizing negative energies to balance over-stimulated areas. Areas depleted of energy can also be re-energized, increasing lymphatic flow, removing toxins and waste products. The treatment usually starts with our experienced therapist covering your body with aromatic ginger then a Swedish-massage strokes before strategically placing heated and hand-polished basalt lava stones across your body. The treatment would last from an hour to one and a half. Improve the flow of energy in your body and achieve a sense of general well being. 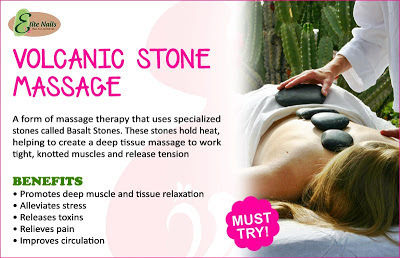 Have a Volcanic Stone Massage today for only P700.00! You can also get updates online via our Facebook fan page and/or follow us at Twitter (@eliteNailsSpa) too.